We begin each day with one of our cabin groups leading our flag raising. Then, we all have breakfast together in our lodge. After breakfast, we all go to the rec hall to choose our morning activity. Usually, there are about 8-10 choices offered each day. Then, we go to our Leadership Workshops. Leadership Workshops focus on skills such as: decision making, conflict resolution, creativity, leadership styles, communication skills, overcoming difficulty, competition and much more! Workshops are generally interactive: we’re busy doing, not sitting in a room talking about it. After Leadership Workshops, we go to our choice activity such as: canoeing, sailing, basketball, tennis, ultimate frisbee, gymnastics, rugby, or lacrosse. At 12:15 it’s time for lunch. But first, we have mail call! After lunch, we sign up for afternoon choice activity. Then, it’s time for Siesta. Siesta is a time of day just for relaxing. Campers take a break from the sun and midday heat and head back to their cabins where they can relax, write letters, read a book or listen to music. Club time is a time everyday where campers choose a club that they have a strong interest in. They will meet with that instructor and group of kids everyday so that they can progress with an activity. Clubs can be typical camp activities such as: Sailing Club, Archery Club, Paddling Club, etc. or they can a group of related activities such as: Ball Sports Club or Survival Club (how to survive a flat tire, how to survive a snack attack, how to survive gym class, how to survive your first dance). From 3:00 – 4:15 p.m. we have free time and open swim! The lifeguards are on duty and the waterfront is open to enjoy swimming and our water toys. There’s usually plenty happening on land too. Snacks are available in the lodge and ice cream is available in the camp store. 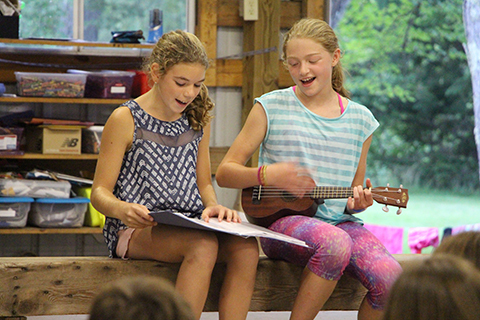 After free time, campers enjoy their afternoon choice activity. They might be playing tennis, doing archery, rugby, gymnastics, dance, art or so much more! We all have supper together in our main lodge. After supper, we join in Camp Pride, where each cabin has a job to help make camp cleaner and more beautiful. It’s part of our mission to develop a sense of community responsibility. Click on each tab to learn more. Mondays are theme nights. We have our own costume shop, so often we’re dressing up for the evening! 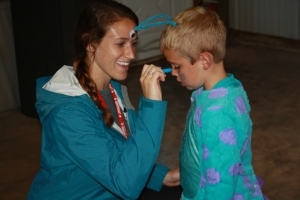 Theme nights have included: Jurassic World, Pirate Night, Harry Potter Night, Around The World, Survival Night, Monsters University and more! 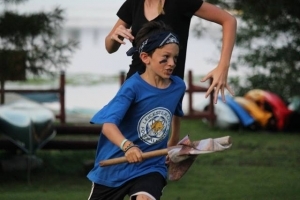 On Tuesdays, we play Capture The Flag, followed by an ice cream party. On Wednesdays, its choose your own adventure night. 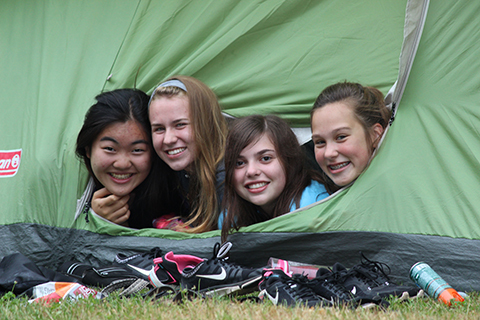 Campers can choose between going on an overnight tent trip or another adventure (it’s different every week!). Thursdays alternate between cabin nights and talent and skit shows. 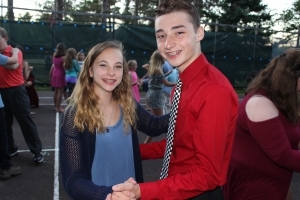 On Friday nights, we have a cookout, eat outside and finish the week with a big celebration and dance! By offering healthy choices at every meal, we’re teaching our kids to enjoy a rich variety of foods.